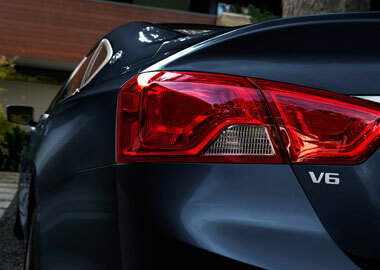 At the heart of Impala lies an available 3.6L V6 engine. Not only does it pack the punch of 305 horsepower, but also hustles from 0 to 60 mph in just 6.8 seconds. The combination of Direct Injection and Variable Valve Timing contributes to the exhilarating, confident ride Impala is known for while supporting impressive fuel economy — an EPA-estimated 29 MPG highway. A premium electric rack-and-pinion steering system provides crisp, responsive handling and an excellent on-center feel. The tight steering radius is complemented by an available variable-effort feature, which increases the level of power assistance during low-speed maneuvers to command city streets and sharp turns. A premium electric rack-and-pinion steering system provides crisp, responsive handling and an excellent on-center feel. The tight steering radius is complemented by an available variable-effort feature, which increases the level of power assistance during low-speed maneuvers to command city streets and sharp turns. The power dome hood, wide chrome grille, projector-beam headlamps and available LED daytime running lamps and high-intensity discharge (HID) headlamps project a bold new face of Impala. 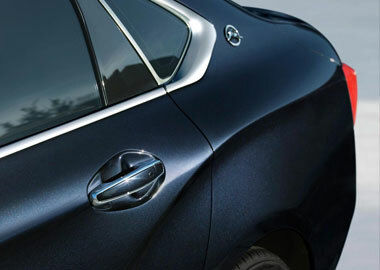 Every angle and curve of this full-size car is deliberately sculpted to capture the eye and harness the wind for an aerodynamic, energized and efficient ride..
2015 Impala LTZ in Blue Velvet Metallic shown with available 20-inch aluminum wheels. To customize the home screen on the available 8-inch diagonal color touch-screen display, you simply drag and drop the application icons into your desired order. The power up/down feature reveals hidden behind-screen storage with a USB port, so you can inconspicuously store and charge your smartphone. Simply pair your compatible smartphone with available Chevrolet MyLink to enjoy the convenience of hands-free calling using simple voice commands. Play music stored on your compatible smartphone or stream it from apps such as Pandora® Internet Radio. Gracenote® will organize your music library and populate song information. The available 11-speaker Bose® Centerpoint® Surround Sound System lets you hear every note of your favorite music and enjoy your three-month trial of SiriusXM® Satellite Radio with crisp, concert-like precision. 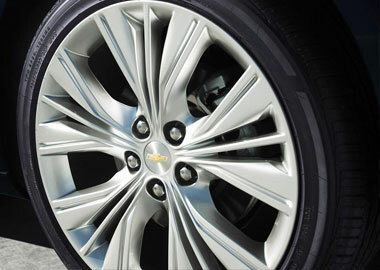 Impala seats five comfortably and offers plenty of convenient storage. With the push of a button, the available 8-inch diagonal touch-screen display goes up and down, revealing and concealing a lockable compartment with a USB port for discreetly charging your smartphone. The center console contains two USB ports and a power outlet for charging multiple devices, plus integrated cup holders to keep beverages secure. There’s also hidden storage under the trunk floor and umbrella holders in the front door pockets to help you stay organized. Using the high-resolution camera to scan for vehicles ahead, this available feature alerts you of a potential crash risk with both audible and visual alerts. Included with available Adaptive Cruise Control, it uses radar mounted on the Impala grille to help prevent and mitigate a front-end collision. If the vehicle ahead slows unexpectedly, it sounds an alert. If you don't react quickly enough, it can automatically apply the brakes. Front Automatic Braking operates whether Adaptive Cruise Control is on or not. This available feature uses radar sensors on both sides of the vehicle to help "look" for other vehicles in your side blind zone areas and alerts you with LED-lit symbols in the corresponding exterior mirrors. Helps you see stationary objects behind your Impala when traveling in reverse at low speeds.